Note: As I'm getting to Big Hero 6 rather late, and I assume most readers have had already had a chance to see it, this review contains mild spoilers. 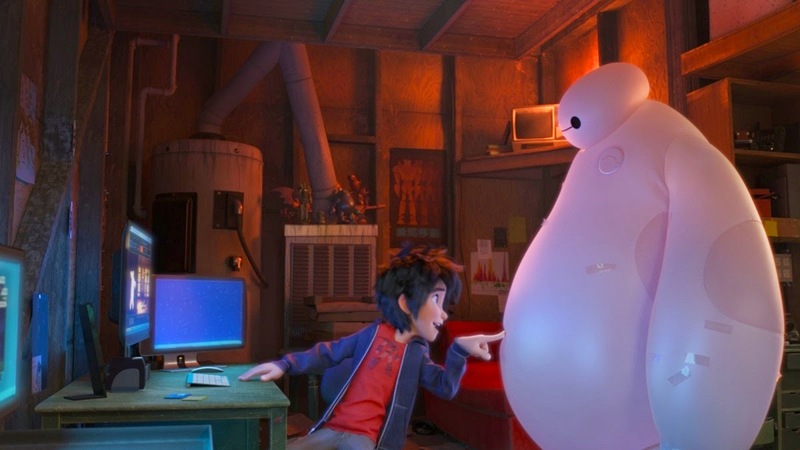 Big Hero 6 is a pretty wonderful exercise in turning narrative familiarity into something genuinely special. On a story level, Big Hero 6 is hardly reinventing the wheel, mixing a lot of basic family film tropes – an orphaned protagonist, Hiro Hanada, experiences yet another loss in his life, and in the process of grieving makes friends and finds a new passion – with a superhero movie 101 structure, where, like Spider-Man or Batman, Hiro is driven at first by righteous fury, the search for justice against his brother Tadashi’s killer leading him and his friends to find their higher, superheroic calling. On a basic storytelling level, there is nothing fresh or challenging to be had here, and while that has frustrated me in a lot of recent Disney projects – Frozen is as classical (and, frankly, dull) as Hollywood animation comes, whatever lightweight nods to modernity it makes (before swiftly abandoning) – a project like Big Hero 6 is an exciting reminder that when true creative passion is involved, the way a story is told matters so much more than the story itself. This is honest, imaginative filmmaking from top to bottom, filled to burst with vibrant characters, unique artwork, and a gentle, goodhearted sense of spectacle that is as refreshing as it is invigorating. Most importantly, Big Hero 6 is the rare family film to have a genuine emotional core; its tale of moving on from loss may be nothing new, but the film is so ripe with pathos, insight, and believable inner-turmoil that it ultimately packs a pretty major wallop – and has a damn entertaining time doing so. Indeed, Big Hero 6 manages to simultaneously be one of the most hilarious and affecting films of the year, the kind of combination that can only come from a strong character core. The film is simply filled with great characters, each corner of its story and world inhabited by fully fleshed-out, three-dimensional human beings. Whether a character is on screen for the entire film, like Hiro, or only in short bursts here and there, like his Aunt Cass, nearly every figure in the film registers as a vivid and compelling creation. The relationships between them is even more satisfying. An early exchange between Hiro and Tadashi, in which the older brother earnestly checks on the safety of the younger before berating Hiro for recklessness – which is then, in turn, mimicked by Aunt Cass when she arrives at the police station in the next scene – speaks to the kind of sharply observed character chemistry this film is built on, where the core of a person or a relationship is related economically through simple, meaningful actions. This creative ethos matters most strongly in illustrating all the core members of the eponymous team, for while characters like Fred, GoGo, Wasabi, and Honey Lemon all conform to various familiar archetypes – the dim-witted buffoon who is more loyal and perceptive than he appears, the angry quiet type who actually cares deeply, etc. – they are all distinctly rendered, enormously funny creations. They share extremely effective chemistry with one another, but they each also possess a clear sense of individuality; their personality traits fuel their differing scientific passions, those passions become their superhero personas, and when they all work together towards a larger goal in the end, the pay-off is exciting because it comes from a well-established foundation of character. Yet the great character creation here is undoubtedly the puffy, lovable, instantly-iconic Baymax who, on the surface, is just another stereotype of modern animation: the funny, adorable, immensely marketable sidekick. He fulfills that role with aplomb, of course, but in this case, it doesn’t feel like a case of reverse engineering from a concrete commercial goal (which is how I feel about most of these character types these days, including, much as others love them, the Minions from Despicable Me). Baymax is his own character, first and foremost, a wonderfully economic visual design – a pair of eyes with a line between them is his only facial feature, and yet the character is positively joy-inducing every moment he’s on screen – with a terrifically endearing, similarly simple vocal performance and a clear set of personality traits – his unending desire to be friendly and help others – that fuels his every action. And that, honestly, is where Big Hero 6 soars most for me. In the early scenes between Hiro and Tadashi, Baymax’s basic medicinal function is laid out quite clearly, and I love that, after Tadashi’s death, the entire arc of the film becomes an extension of Baymax’s programming. He wakes up in Hiro’s room, on a day when Hiro is at a particularly low point of grieving, and after that initial moment of recognition and empathy, every part of the story stems from Baymax’s mission to make Hiro feel better. It’s plenty easy to throw together a story about someone in mourning, where the ultimate answer to moving past grief lies in finding something one is passionate about and sharing that passion with friends and loved ones. On its own, without any deeper consideration about what that message means, it’s nothing more than a platitude, one that has been sold in plenty of family films before now. 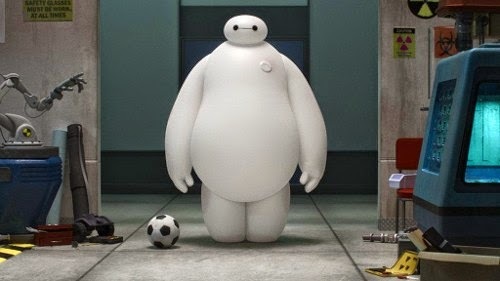 But because Baymax has this robotic instinct to identify pain and do whatever he can, as compassionately as he can, to help heal that pain, and because Baymax is the force that gives the plot its structure – without drawing too much attention to it, the film is constantly setting up that moment where Hiro will finally say “your service has been satisfactory” – I found myself responding to this message in ways I often don’t. While it certainly helps that Hiro is sharply characterized in his own right – his emotions and instincts feel human at all times, neither oversimplified nor overwrought – it’s Baymax, and the core foundation of simple compassion he brings to the movie, that ties all the film’s themes about friendship and empathy together, and that makes the film’s sentimental nature feel genuine. This is, quite literally, a story about ‘healing,’ and the complex emotions that go in to being there for another person, no matter the circumstances – note that the entire climax is built around Hiro saving his nemesis’ daughter, even as he cannot ‘fix’ his own loss – and I think there’s a certain brilliance to literalizing this point so playfully and effectively through a character like Baymax. On a technical level, the film is an impressive accomplishment. While I have some reservations about the physical texture of the character designs – as is often the case in CGI animation, human figures look like plastic, detracting from what are otherwise exemplary character designs – the animation on the whole is beautiful, its unique and colorful Japanese-esque setting looking a little unlike any other animated film in recent memory. And when it wants to go for spectacle, this is a film that delivers beautifully. The action set-pieces are exquisite, of course, smartly taking a page from the playfully character-centric battles in the live-action Marvel movies, but it’s the flying sequence with Hiro and Baymax that enraptured me most. This is, again, an echo of scenes we’ve all seen in other movies – I thought back most forcefully to How to Train Your Dragon and the first flight between Hiccup and Toothless, but the trope goes back further than that – and yet, because of the beauty of the artwork (look at those sunsets! ), and because of how meaningful the moment is in the relationship between Hiro and Baymax – the flight provides release and catharsis for Hiro, while also allowing Baymax to realize that this superhero craziness is what Hiro needs to feel better – the sequence worked 100 percent for me. Awe was, indeed, inspired. In this way, Hiro and Baymax’s flight is the film in microcosm. As familiar as it might seem on the surface, Big Hero 6 is truly inspired where it counts most. Special, even, for Baymax if nothing else – and there is plenty else here to love. Perhaps what excites me most about Big Hero 6, and the huge level of success it has found with audiences, is that it has a true passion for science – even if most of the ‘science’ we see is largely fantastical – and encourages children to take an interest in invention and discovery. It makes intelligence, education, and scientific ambition all look cool, and that is something we are in desperate need of these days. This is not only an entertaining film for children, but arguably an important one – and with plenty to offer people of all other ages as well. Big Hero 6 is a real animated treasure.